The most eagle-eyed of you may have noticed an error in one of the knots in the group photo of the knot conformations series on Day 266. We got one of the crossings wrong in 7_4! Specifically, we accidentally made a print of P(-3,1,-3) - that is, three negative twists on the left, one positive twist in the center, and three negative twists on the right - when we needed a print of P(-3,-1,-3). Since we reversed the crossing in the middle we made a knot that can be moved into a projection with fewer than seven crossings. 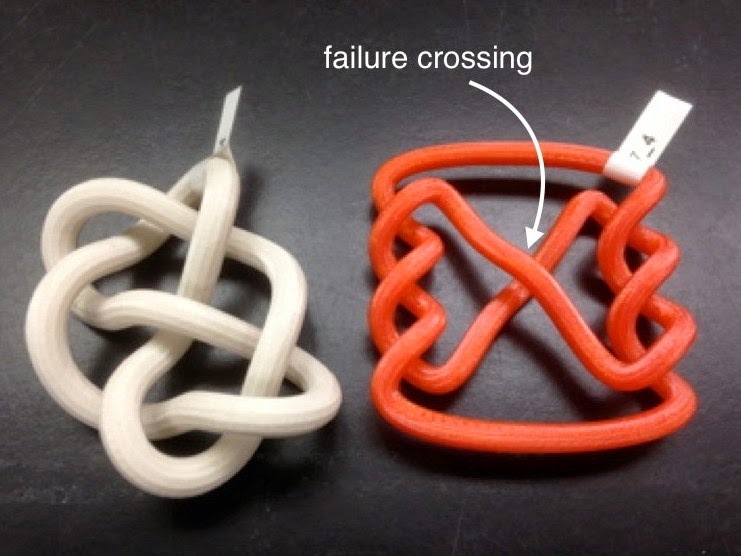 If the knot were made of rubber, we could grab the overstrand of the center crossing and stretch it out around the outside of the knot, eliminating three crossings. This means that the knot we printed has a crossing number of at most four, so must either be 4_1, 3_1, or the unknot. Bonus question: Can you tell which? Here is the fixed version, although to confuse you we decided to swap all of the *other* crossings instead of changing the center one. In other words, we printed the pretzel knot P(3,1,3), which is still a conformation of the knot 7_4. Settings: MakerWare .3mm/low on a Replicator 2 with custom knot slicing profile. 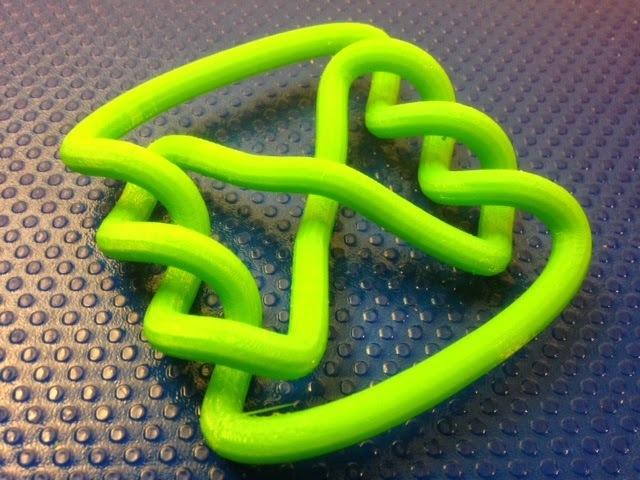 Technical notes, math flavor: This knot was made by JMU students Greg Houchins and Kirill Korsak, who used Mathematica's KnotData package to export an STL file of this pretzel conformation. How did they know this pretzel knot is 7_4? Because they computed its knot determinant and the answer was 15. Since the pretzel knot above is in a projection with 7 crossings, we know that its crossing number is at most 7, and therefore that it is one of the first fifteen knots in the Rolfsen table. Only one of those knots has determinant 15, and that is 7_4. Below is a handy table of determinants for the knots through 7 crossings, generated by the amazing KnotInfo site.